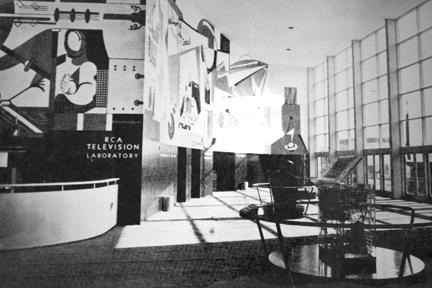 Upon entering the RCA Pavilion, the first thing visitors saw was the Phantom Teleceiver, now a prized piece in the MZTV Museum Collection. Not only was this television set accented by an extraordinary futuristic mural that communicated a fascinated excitement about new technologies, it was also bathed in sunlight from a spectacular glass curtain wall. As for the capabilities of the set itself, people were amazed by the quality of the television pictures on this extraordinary unit. The great majority of visitors had never seen television before, and the set’s transparent Lucite cabinet removed any doubts that magic or trickery was involved in achieving the pictures.